This Presentation date is September 20, 2018 at 13:00-15:00 local time. Vlad Karaiev, Principal Project Manager, introduces the delegates to StarWind, a virtualization pioneer focused on delivering Software-Defined Storage solutions, HyperConverged and Storage Appliances, all designed to build high performance IT Infrastructures. Max Kolomyeytsev, Director of Product Management, and Taras Shved, Director of Engineering, look at the underlying reasoning behind StarWind’s NVMf target. They discuss design benefits of NVMe vs legacy protocols and discuss the foundation needed when building high performance storage solutions. This session covers NVMf target v1 description. Taras Shved, Director of Engineering, gives a demo fo the StarWind NVMf target in action. Max Kolomyeytsev, Director of Product Management, covers the NVMf initiator architecture and benefits for VM-based solutions. 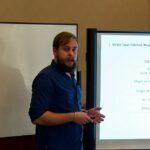 Vlad Karaiev, Principal Project Manager, looks at use cases for StarWind’s NVMf technology in IT infrastructures at different sizes and scales. Anton Kolomyeytsev, CTO, Chief Architect, and Co-Founder, and Stephen Foskett lead a roundtable with the Storage Field Day delegates, discussing the latest in the company’s and industry’s NVMe development.